Designed to serve as the heart and brain of your connected home theater system, the AVR-X4000 IN-Command 7.2 Network Home Theater Receiver is packed with connectivity, system configuration and control options. The powerful amplifier section features 7 discrete output stages with identical circuit topology, with each channel rated at 125 watts, easily able to drive today’s quality loudspeakers. Featuring 7 HDMI inputs (including 1 on the front panel), the AVR-X4000 also features 3 HDMI outputs, including 2 for the main room and 1 for another room. For the ultimate surround sound experience, the AVR-X4000 features Audyssey DSX, Dolby Pro Logic IIz and DTS Neo:X decoders, which lets you add front height or wide speakers to dramatically expand the front soundstage, along with dual subwoofer outputs for systems with two subs. 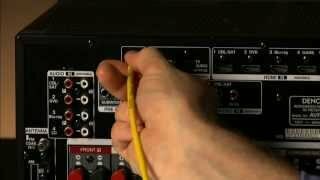 The AVR-X4000 features Audyssey Platinum, our most robust level of Audyssey support with Audyssey MultEQ XT32, Audyssey Dynamic Volume, Audyssey Dynamic EQ, Audyssey DSX, Audyssey Sub EQ HT, Audyssey LFC, and Audyssey Pro. Audyssey MultEQ XT32 harnesses the power of sophisticated DSP processing, measures the acoustic output of the speakers and subwoofers, and generates multiple digital EQ filters with 256 times the resolution of standard MultEQ. This provides the smoothest, most natural tonal balance in virtually any room. Audyssey DSX offers the option of front wide and front height speakers which are placed to the left and right or above the main front speakers to broaden the width and/or height of the soundstage, making the audio experience more impressive, engaging, and believable. Audyssey Dynamic Volume senses the impending arrival of very loud sounds and automatically reduces the difference between normal and extra-loud programming. Audyssey Dynamic EQ automatically adjusts subwoofer and surround speaker levels for maximum performance at any playback volume. Audyssey Sub EQ HT provides individual tailoring for dual subwoofer setups. Audyssey LFC (Low Frequency Containment) provides a full range tonal balance for late-night listening that minimizes the intrusion of deep bass content into adjacent rooms or spaces. The AVR-X4000 is also Audyssey Pro Installer ready. Audyssey MultEQ XT32 automatic room acoustic measurement and correction harnesses the power of sophisticated DSP processing, measuring the acoustic output of the speakers and subwoofers and generating multiple digital EQ filters that provide the smoothest, most natural tonal balance in virtually any room. 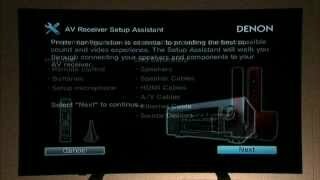 The AVR-X4000 is also Audyssey Pro Installer ready. Audyssey Sub EQ HT provides individual tailoring for dual subwoofer setups. Audyssey LFC (Low Frequency Containment) processing provides a full range tonal balance for late-night listening that minimizes deep bass content from intruding into adjacent rooms or spaces. 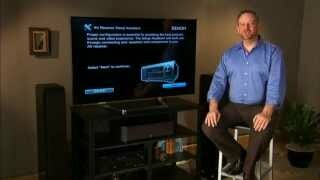 In addition to the latest high resolution decoders, including Dolby TrueHD and DTS-HD Master Audio, the AVR-X4000 7.2 receiver also features Audyssey DSX, Dolby Pro Logic IIz and DTS Neo:X decoding, which lets you connect an additional pair of front height or wide speakers to dramatically expand the front soundstage, transforming your home theater room into a large venue cinema space. In addition to conventional remote control, the AVR-X4000 is equipped with a range of additional control options, including the “Denon Remote App”, which is available in iOS and Android versions, which lets you control the unit with your favorite smartphone or tablet. You can also control the AVR-X4000 via the web control function, which you can access via your PC’s web browser. Equipped with both LAN and RS-232C serial port connections, the AVR-X4000 is compatible with a broad range of home automation control systems from companies including AMX, Control4, Crestron, RTI, Savant and URC. The IR remote input and output jacks provide even more control options, and the unit features two 12V assignable trigger outputs for projection screen and motorized drapes control. You can set up the AVR-X4000 to enjoy music and video in the main room, while others enjoy music and video in a second room. A second zone HDMI output lets others enjoy a different program in another room, and the Amp Assign function lets you use two of the amplifier channels to drive stereo speakers in the second room. By connecting a stereo amp to the AVR-X4000, you can even have a third audio source playing in another room. Equipped with Apple’s AirPlay function, the AVR-X4000 lets you stream your favorite tracks from your iPod touch, iPhone and iPad via your home network. You can also access your favorite iTunes tracks from your computer or connect your portable device directly via the front panel USB port. The unit is also DLNA 1.5 compliant for connection to your multimedia PC and is Windows 8 / RT certified. Enjoy a world of digital radio entertainment with HD Radio. Many popular AM and FM stations now broadcast in HD Radio, which also provides the ability for stations to broadcast additional programming channels. With HD Radio, AM sounds like FM, and FM sounds like CD. For the ultimate audio fidelity, connect the Denon DBT-3313CI Universal Blu-ray player via Denon Link HD and HDMI, which provides advanced jitter reduction processing that extracts the utmost fidelity and widest dynamic range from your favorite high resolution music discs. For connection to a broad range of digital sources, the AVR-X4000 features 7 HDMI inputs, including 1 on the front panel that lets you quickly and conveniently connect a camcorder, game console or other HDMI-equipped device. There are dual HDMI outputs for the main room, and a third HDMI output for another room. The HDMI functionality is further expanded with HDMI Standby Pass-through, which lets you view a source (such as a cable or satellite box) on your HDTV when the AVR-X4000 is in standby mode, which is ideal for casual viewing of news broadcasts and the like. "I've got to hand it to Denon. I haven't been this impressed by a receiver in a long time. Well done. 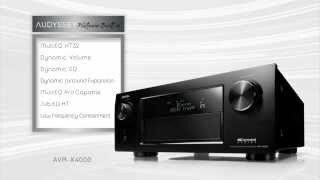 Denon hit one out of the park with the AVR-X4000."